We will be having High hands 7 days a week. All during the month of April we would like to say thank you to all the wonderful payers we have had the pleasure of meeting. Chasers Poker and casino would be nothing without your support. We wish you many wins and fun times! Must have $20 in the pot to be eligible for High Hand, with a minimum of 4 active players. Minimum Hand qualifier of a Full House to get credit for a high hand. Cards must be tabled within a qualifying time period. Qualifier for the Major must lose with a straight flush. Qualifier for the Minor is to lose with quads or better (Quads must be a pocket pair.) Major starts at 10K and will increase every Friday by 1K. 40% losing hand, 20% winning hand, 40% table share. $700 for the losing hand and $300 for the winning hand. The major and minor chase can not be hit at the same time. Hitting the major will not also trigger the minor. Minimum of 4 active players must have $20 in the pot. Two Hole Cards must play. Pocket Pair needed when qualifying hand is quads. A progressive Jackpot will increase $50 every 30 minutes. The Catch of the Day High Hand Qualifier will also change every 30 minutes ($4,900 max). If the Catch of the Day isn’t caught by the end of the high hand period, the following Sunday will start at the previous weeks ending amount and continue to grow. To be eligible for the Catch of the Day Progressive Jackpot Players must be playing a on a qualifying cash Hold’em table. Must have $20 in the pot to qualify. All Hole cards must play to have a qualifying hand. Player must have a pocket pair when qualifying hand is quads. Catch of the Day Progressive Jackpot hand must be dealt and announced with-in the correct 30-min time period to be valid. Thank you to all our players! Because of you! Rolling High Hands are now EVERY Thursday!! In addition to the 10K Chase, Chasers will be launching the NEW Mega Chase that will have a qualifying requirement of quad 8’s and will increase $2,000 every Friday. This will not trigger the 10K chase. Players are only eligible for one jackpot win at a time. Pocket Pair needed when qualifying hand is quads. Hand must be Holdem to qualify. and re-activated on the following Friday. Weekly Hand Reductions are as follows. To be eligible for the Chase, A minimum of 4 active players on a qualifying cash Hold' em table, Must have $20 in the pot to qualify. All Hole cards must play to have a qualifying hand. Player must have a pocket pair when qualifying hand is quads. Must be 18 years of age with a state issued ID to play. your rewards instantly. Swipe your Chip Card right at the table by giving your card to the dealer. Ask us how to become a Royal Member and receive our most exclusive player perks. Rewards can be redeemed for food, beverages and merchandise. 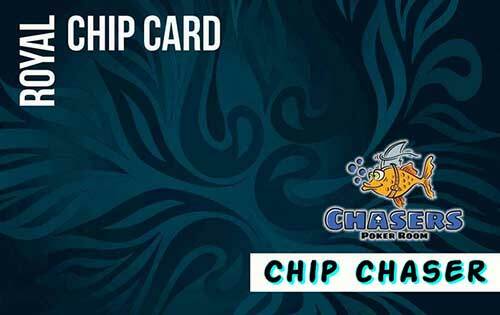 Link your email to the Chip Card and you will be notified of all the exciting new rewards and upcoming promotions that Chaser's has to offer! Get a Royal Flush and we will give you $300! Flop it… We’ll make it $1,000! Must have $20 in the pot and use both hole cards! 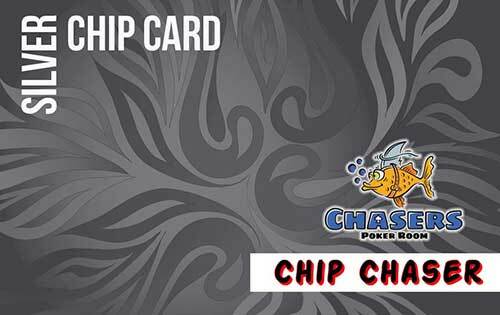 At Chasers Poker Room & Casino, we are always trying to bring you new and exciting gaming promotions and specials events. We look forward to seeing you win! !